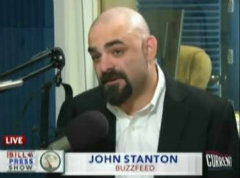 Don't be surprised if you hear less from John Stanton out of left-wing media in the foreseeable future. Press told BuzzFeed's Washington bureau chief of bumping into Jackson at George Washington University Hospital back in June after Press popped a hernia, Jackson telling Press he was "feeling a little under the weather." "The last time anybody saw Jesse Jackson Jr. in this city," Press added, "and I didn't realize that was the beginning of a long saga which ended over the weekend when he resigned from the United States Congress. Why?" PRESS (sensing trouble in conversation): He said in his statement he's cooperating with federal authorities in this criminal investigation. What are they investigating? What alleged ...? STANTON: ... yeah, and you know, it's a little sad. You know, I mean, you know, you see a lot of these guys go down and they sort of give these terse little statements or whatever and, you know, you look at his statement and it really was this sort of apology almost to his constituents. Just about the last place you'd expect speculation along these lines -- aside from MSNBC -- but intriguing nonetheless. 2012 Congressional Radio John Stanton Bill Press Jesse Jackson Jr.